Beer and food—a classic combination. Now, any restaurant worth its salt makes their own food from scratch, but what about beer? Brewing onsite is more of a challenge—you need space for equipment, storage for your liquid gold and a skilled brewer to transform a few simple ingredients into something special. That said, when the brewpub is pulled off, an intriguing hybrid emerges, somewhere between home brewer and production brewery—small batches lead to variety and experimentation while top-flight technique results in a superior product. As a budding beer mecca, Philadelphia is an obvious choice for this kind of business. 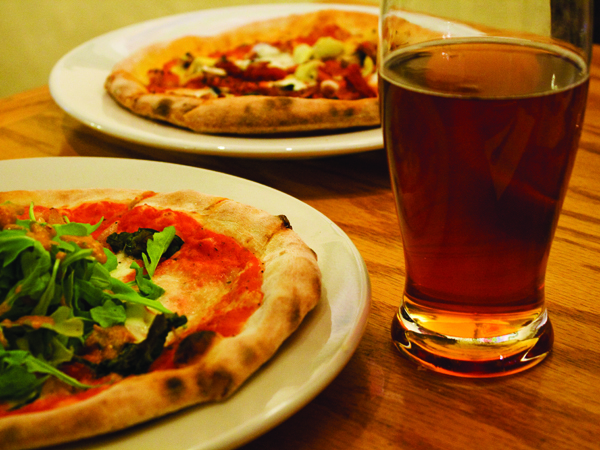 These local brewpubs make sure their patrons eat—and drink—very well. Husband and wife Tom Baker and Peggy Zwerver have been brewing beer for a long time. For years, they ran Heavyweight, a production brewery in New Jersey that distributed up and down the East Coast. The couple had friends in Vermont who ran American Flatbread, a brewery and restaurant that specialized in artisan flatbreads. With that concept in mind, they decided to move into the retail side of things, opening Earth, Bread and Brewery on Germantown Avenue in October 2008. Nailing down a simple, satisfying menu was just as important for making their concept work. While the couple looked for a location, Baker spent months working on Earth’s dough recipe (made with King Arthur Flour). They’re topping their flatbreads with everything from local turkey sausage to fresh arugula to banana pepper pesto to pumpkin seeds and roasted garlic. They also serve up creative salads—including one with wheatberries, citrus vinaigrette and baby arugula—cheese plates and dips (including white bean and artichoke). Desserts come from Night Kitchen Bakery up the road, and the ice cream is made by Chilly Philly, a Mt. Airy company. When launching Earth, controlling the restaurant’s environmental impact was a huge priority. “Tom and I have always been really environmentally minded,” says Zwerver. “We wanted a restaurant that reflected that. So many restaurants are so wasteful.” They use Philly Compost (for both food scraps and beer byproducts), and produce only about three bags of trash per week. “My whole staff knows the three places—recycling, trash and composting,” she adds. They also source locally whenever possible, getting produce from the (very) nearby Weaver’s Way Farm during the growing season, cheese from Lancaster County and chickens from Delaware. Iron Hill Restaurant and Brewery is a different kind of animal—a local mini-chain with eight locations in the Philadelphia suburbs. They’ve developed a devoted following thanks to interesting brews, thoughtful food and a family-friendly atmosphere. The brand new Maple Shade, NJ, location (only a 20 minute drive from Center City) is lucky enough to have veteran brewer Chris LaPierre at the helm. He’s been with the company for seven years, and worked at Dock Street before that. LaPierre also started as a home brewer. While studying journalism at Syracuse, he found himself with some time to kill. “During the summer semester, everyone would go home,” he explains. “So I needed a hobby.” After graduation, he worked in a brewpub to earn some money while sending out resumes. Eventually, as he became more passionate about the brewing trade, he stopped sending them out. Iron Hill has five house beers that are always on tap at every location, but there are usually five to six other options available. This leaves brewers with a lot of room for experimentation. Currently, at the Maple Shade location, LaPierre is working on a black IPA and a Flemish red (a sour beer) aged in wine barrels. LaPierre likes big beers, but he also has a soft spot for well-executed session brews with moderate to low alcohol content. “I have real appreciation for the lighter, more balanced beers,” he explains. “I think they’re more difficult to brew—there’s less margin for error.” LaPierre also loves Belgian beers and has dabbled a bit with “American Belgians.” Brewed with Belgian yeast and American hops, the resulting brews have a bright, fruity finish. Dock Street’s menu focuses on wood-fired pizzas and rotisserie chicken. The pizzas provide the platform for some creative combinations, such as brie, pears and rosemary; caramelized onions, gruyere and fresh thyme; and leeks, spinach and crème fraiche. The restaurant sources their ingredients locally whenever possible—spent grains from the brewery even go to a Montgomery county farmer who supplies their beef. And Potts often gets flavors for his brews locally as well; fresh herbs and fruit come from nearby farms and honey comes from a supplier in Berks County.